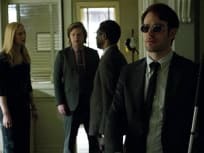 On Daredevil Season 1 Episode 13 a boxed-in Fisk and a desperate Murdock, Foggy and Karen are forced to play their end games. 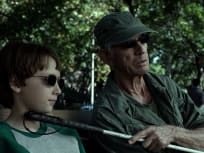 "The Ones We Leave Behind"
On Daredevil Season 1 Episode 12 Fisk seeks revenge while Karen is haunted by recent events. Daredevil makes a startling discovery about Fisk's financing. 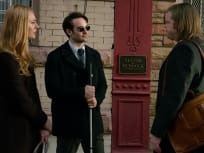 On Daredevil Season 1 Episode 11 Fisk and Murdock wrestle with the consequences of their chosen paths, while Ben and Karen get closer to Fisk's true past. On Daredevil Season 1 Episode 10 Murdock and Foggy's relationship is put to the ultimate test while a new enemy against Fisk emerges. 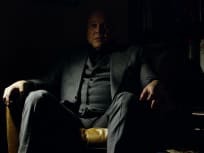 On Daredevil Season 1 Episode 9 when Fisk gains the upper hand, the goal to destroy him becomes even more difficult, while Daredevil faces his own demons. 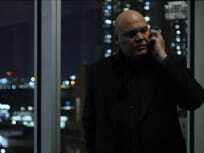 On Daredevil Season 1 Episode 8 Fisk's world spins further out of control, while Murdock, Foggy and Karen's mission becomes clearer. 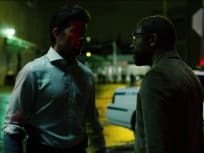 On Daredevil Season 1 Episode 7 An important figure from Murdock's past reemerges seeking his help to battle a new enemy threatening Hell's Kitchen. On Daredevil Season 1 Episode 6 Daredevil finds himself trapped in the fallout of Fisk's plan to take control of Hell's Kitchen. Ben Urich digs closer to the truth. On Daredevil Season 1 Episode 5 Fisk moves forward with plans that threaten to rip Hell's Kitchen apart. Murdock and Foggy take on a case helping tenants victimized by a slumlord. 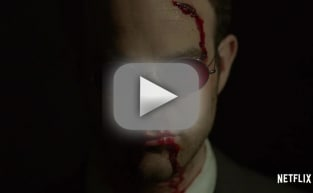 The Russian brothers story was explored on Daredevil Season 1 Episode 4. Fisk made some important moves to further consolidate his control of the criminal underworld.